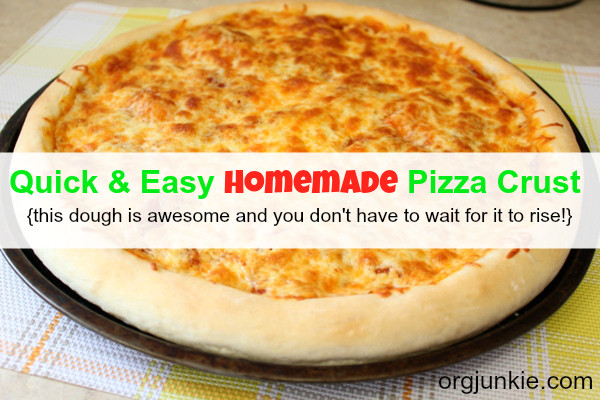 This quick and easy homemade pizza crust recipe is so fast to make and you can literally whip up a delicious homemade pizza in no time flat. It’s absolutely delicious! The best part is you don’t have to wait for the dough to rise! Give it a try, you will love it! Add the rest of the ingredients in and mix. 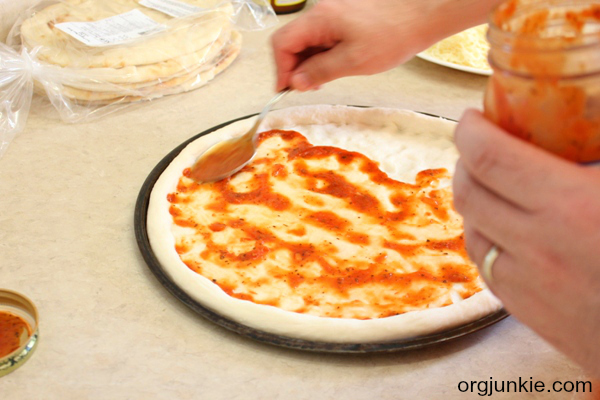 Add some pizza sauce and your toppings. Bake at 375 degress F for around 30 minutes until the crust looks crispy and lightly browned on top. The dough can also be frozen as well. When it’s still in a ball tightly wrap in cling wrap and then place in a Ziploc type bag. Note: I also make this gluten free as well substituting the flour with equal portions of the gluten free flour mix below. Thanks for posting….I am going to try it. I normally make a couple up and partially bake them (425 for 8 min.) I freeze them this way so it is quicker than thawing and waiting for rise. This recipe is similar to the one I use but I got mine from Momadvice and it has some spices (onion, garlic salt in it) kind of stinky so I should try this one some times. I was just about to go look for this recipe!! I’m doing it on Friday. 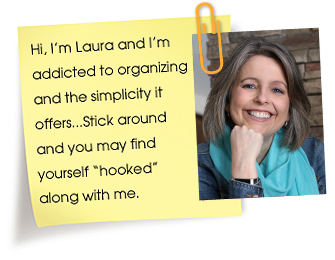 Thanks Laura! Yes that is the link I have as well Lisa but unfortunately it isn’t working for some reason. That’s a great recipe! Adding a bit of corn meal to the greased pan will also add a bit of crunchiness and authenticity as well. Easy step with great results! Thanks for sharing this recipe. 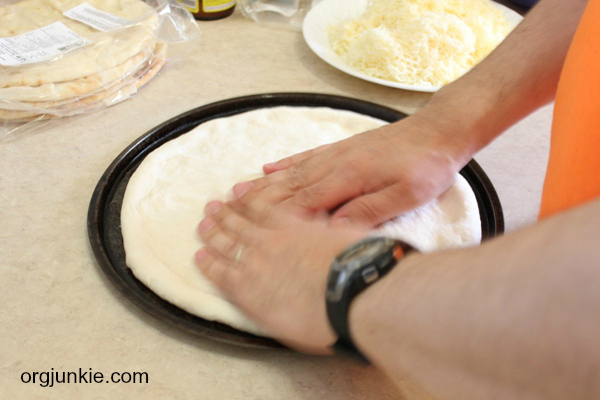 I am looking forward to trying it.I’m always looking for a good pizza dough. Is there any way that you could share what the monthly round up area is going to be for January? I haven’t participated before and I am looking forward to doing so in the New Year (although I may jump in on this month’s). Hi Robin, I haven’t decided yet if I’m going to continue with the round-up. I’d possibly like to change things up a bit. Ideas? Seriously no need for this dough to rise first? Yippee!!!!! If you discontinue round up I think you should still have a running room by room thing maybe posted in the side bar—it helps inspire those of us who are wannabe organizers but lack motivation to get on it. I’ll have to try that! I found a really good recipe (I have it linked on my blog, so gonna change my website on here to the appropriate one lol) but it has honey in it so I’m always having to cook a second meal on pizza night for my baby. I make this as well, it’s great! I add a tsp of Italian seasonings. Gives it great flavor. Thanks for the recipe. I think I will be trying this out soon. I’ve been looking for a good pizza dough recipe. And this just looks too easy! I have a website, not a blog, but I linked you to what we’re having for dinner tonight; it’s my own cheaper alternative to Rice A Roni’s spanish rice, and it’s all rice (no pasta, which is helpful to those who can’t have wheat). I plan my meals seasonally by what is cheapest that season and by what is fresh in my garden. I love your site! This is really going to help me get organized! I’ve posted my week’s menu plan… I use mostly organic, local veges, and whatever’s on special, and I cook most things from ‘scratch’. I’m wheat free, sugar free and mostly dairy free. I love homemade pizza. 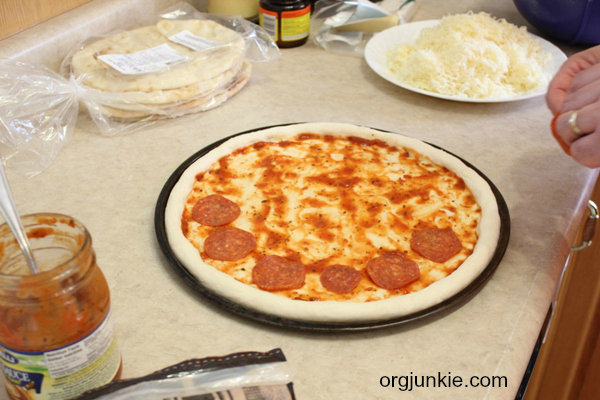 We usually divide up the dough so that everyone can make their own personal pan pizza with exactly what they want on it and nothing else – eliminates complaints I’ve found. The recipe that I was given by a friend is pretty much the same, she uses it as it has no milk products so her son can have it. This was delicious and SO easy! Thanks for sharing. Your MPM has single handedly changed the way we eat and cook in my house. Thanks so much for your hard work! I made this tonight, it was great! Oooh, that looks good! I’ve been making a variant of Robyn Ryberg’s gf crust (uses corn starch and potato starch, no other flours), and it’s okay, but it’s so sticky, it’s very difficult to work with. How similar in consistency is the gf dough to the “real” dough? And how big a pizza pan do you use for this recipe? Would a 9 x 13 cookie sheet work? Where do I find the other flours? All I can find is brown rice flour. HELP!! My son has Celiac. This is great. 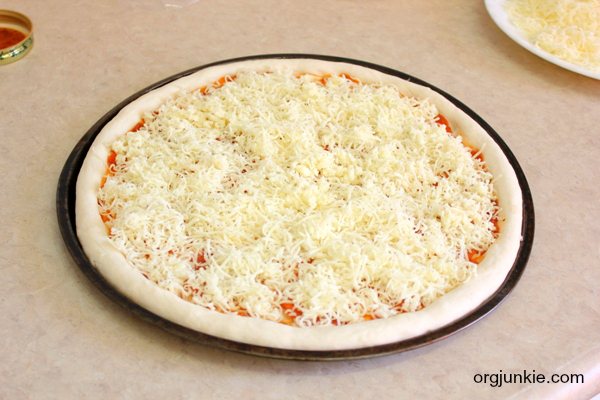 I usually use Pillsbury pizza dough in the little cylinder shaped containers just because it is easy. The problem is that it’s usually a very flat pizza and sometimes soggy. It looks like making a thicker dough isn’t too difficult. Tried the regular pizza crust tonight. It was excellent! I used olive oil and the 4 kids, the nephew and the husband all loved it. Thanks for posting!